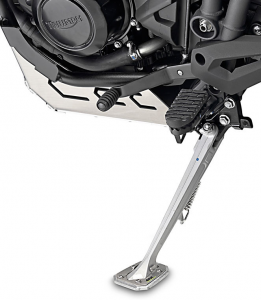 I did a fair bit of research on whether I should buy a center stand for the motorbike. 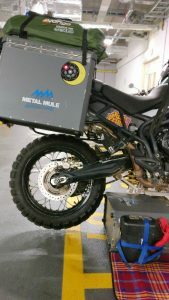 Obviously, they are the default option for adventure bikes, making servicing much easier as you can have the tyres off the ground in seconds. But in an effort to keep weight and costs down I’ve been testing using panniers as a stand. There are some advantages to this but also limitations and considerations. Firstly, you’re going to be putting alot of weight on the kick stand. So you need to get yourself a kick stand shoe. My tiger as a R&G shoe.. This should be enough on a flat surface like tarmac etc, but on anything else I’d also recommended using a small plank of wood to ensure the kick stand is stable. Secondly, strong panniers. I have metal mule panniers. They are ridiculously strong. 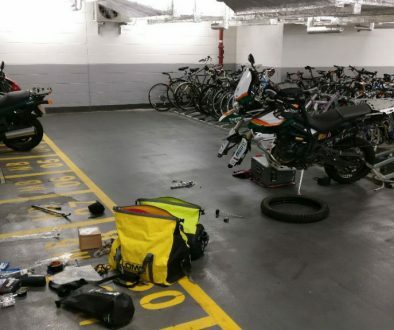 Lifting the bike on them doesn’t even leave a mark. Thirdly, you need to be able to lift the bike. 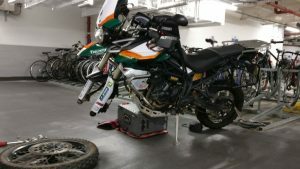 I have a tiger 800xc it is heavy. Keep your back straight and use your legs to lift. Tie the back wheel to a solid object. better if the object cant be moved at all. NEVER stand/lift/sit on the kick stand side of the bike when doing this. If the bike is going to fall it is going to fall that way. Never put yourselves in the position where the bike could fall on you. Lift from the other side. 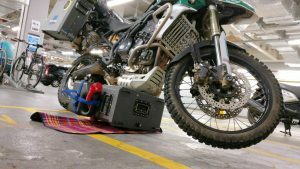 Put the pannier on the ground next to the engine guard. For the front of the bike to rise you need to slide the pannier under the front of the engine guard. Lift the bike onto the kick stand and slowly slide the pannier under the bike. I put the pannier on a mat to make it easier to slide. Once under make sure the bike is stable. Once done. Lift the bike further onto the kick stand and then slide the pannier out with your foot. Take a cable tie and tie the front brake on. Tie the front wheel to a solid object. better if the object cant be moved at all. 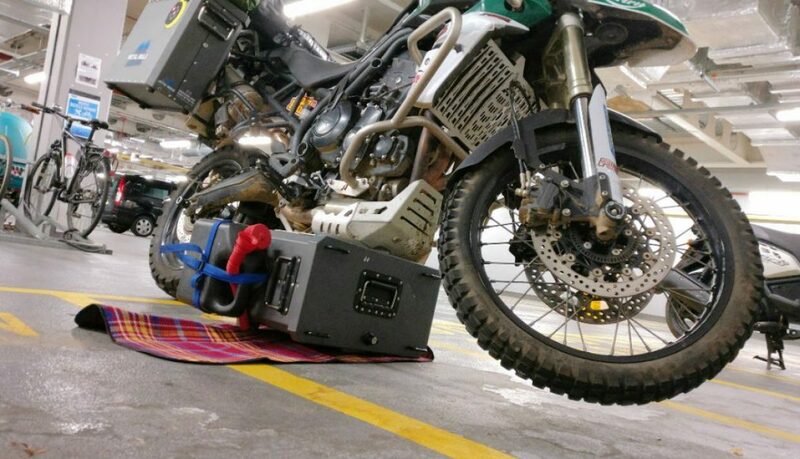 Put the pannier on the ground next to the engine guard. For the back of the bike to rise you need to slide the pannier under the back of the engine guard. Lift the bike onto the kick stand and slowly slide the pannier under the bike. I put the pannier on a mat to make it easier to slide. 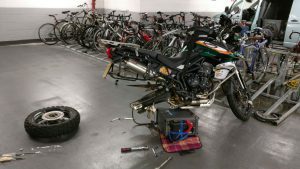 Once under make sure the bike is stable.